SCALABLE SERVICE AND SUPPORT. WE'VE GOT YOUR BACK. Forget about costly generator rentals & maintenance – our PCM handles the power direct from the utility company. Avoid costly down times and delays occurring from faulty equipment or maintenance. We’ll install the PCM and you can continue working. Eliminate need to illegally piggyback power for your construction site. The PCM stays attached to the site is part of the build. A PCM Eliminates the need for a temporary service installation because the same unit ultimately becomes the permanent service installation. Residential – 100-400 amp. Commercial – single and three phase application. The patented PCM from Your Electrical Solutions provides a support system, a riser pipe, a meter socket, and a 1 or 2 duplex receptacle power panel. PCM’s can be custom built to accommodate customer and utility specifications. 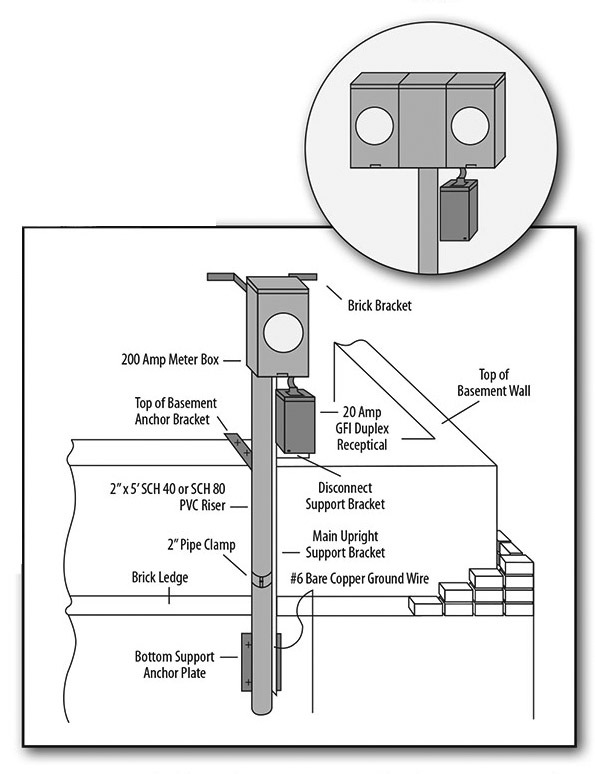 The PCM allows the underground contractor or electrical contractor to easily attach the unit to a basement wall or slab. The permanent service is then brought into the PCM and power is immediately available for use. Contact our office at (734) 547-9237 to order your PCM today! STANDARD PCM has a power panel with a 20 amp, 1 pole breaker and GFI duplex receptacles. After rough installation, the power panel is removed and can be returned for credit.